Welcome to our gallery of previous painting events. 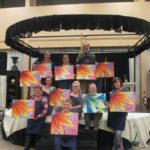 Here we show the best pics of each paint class as well as the group photo. Enjoy!